After my failure to bring skis along on the hike up Manzanita Creek (see TAY report), I knew I wouldn't repeat that mistake the next day. 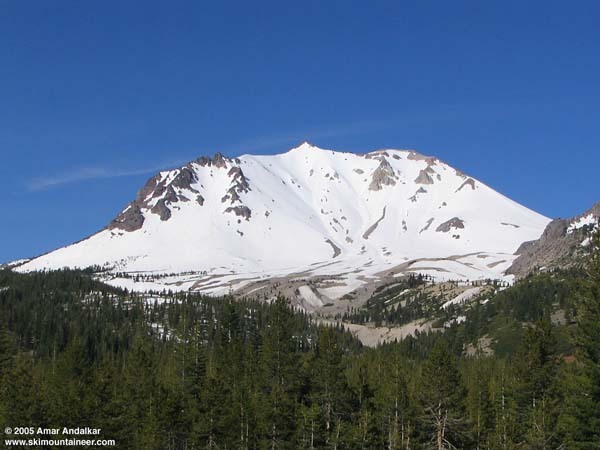 I planned to drive around to the south side of Lassen Peak and do the standard up-and-over ski of the NE Face, with a twist. Last year, I had climbed the trail from the 8450 ft parking lot to the summit and skied down the face to the Devastated Area (3500 vert of ski descent with only 2000 of ascent), then hitchhiked 12 miles back to my car (see TAY report). This time, I wanted to try skinning back around to the south side via the West Fork Hat Creek drainage, which appeared to offer quick and easy access around the east side of the peak and right to the base of the SE Face beside the summit trail. As I drove past the Devastated Area parking lot at 6450 ft Emigrant Pass, I studied the usual excellent view of the NE Face (see photo below). Snow coverage on the face is just a tiny bit better than the same day last year and looked good down to below 7000 ft in the gullies. Farther along the drive, the nice view of the Southeast Face from 7300 ft Kings Creek Meadows showed roughly the expected amount of coverage up high, definitely enough to easily skin to the summit crater (in the photo, the summit trail follows the edge of the mostly bare South Ridge). I skinned up from the parking lot at 9:30 AM, along with two women telemarkers from Colorado whom I had met in the campground the previous evening (they had come to Lassen to find snow, but had no map or other route knowledge). It was a bit later than planned since I hoped to ski off the summit by 11 AM to find optimal conditions on the NE Face. The skin up the trail and ridge went quickly, although the others eventually switched to carrying their skis as the slope steepened above 9800 ft. I skinned up to the 10350 ft summit crater and spent some time exploring the crater and upper northern flanks on skis (see a 5-image panorama at 2 resolutions: 2200 or 4400 pixels wide). It seemed much warmer than the previous day, and the snow was already soft in the crater by 11 AM. The last 100 ft to the summit are bare on the trail side, but a look up at the NE Face from the north crater rim showed choppy recent snow in the 48-degree pitch dropping directly off the summit. Not the smooth corn I was hoping for, but skiable. After my crater tour, I reached the summit at the same time as the two women telemarkers, who looked down the steep face and decided to take the much easier entry angling in from the north crater rim (35-40 degrees there). As I prepared to ski off the top, a couple of yahoos from Lake Tahoe arrived, complete with alpine skis and raging testosterone. They were really going to try to impress the two women, and I knew I better get the heck out of there quickly for personal safety. At noon I skied down the choppy snow of the steep face, not as bad as I thought, just in time to look up and see a pair of ski tips already poised to launch air off the summit. I escaped to the safety of the edge of the chute just before the Tahoe dudes flew down the face. They had stashed a second car at Hat Lake, and planned to car shuttle back around, with the telemarkers hitching a ride. The main part of the face had already softened too much, so we all traversed well to skier's right, trying to hit the most northerly aspects which had the best corn snow. Conditions remained generally good to excellent down to about 8500 ft, where things got very sticky. I parted ways from the others at this point, making an angling descent below the rocky East Ridge of Lassen Peak and down to about 7600 ft in the West Fork Hat Creek drainage. The snow was very sticky and the slope flattens at this point, so there was no reason to ski any lower. I skinned back up, following an obvious gully which turned out to be a side branch, forcing me to cross some bare pumice in order to angle into the main gully (which had continuous snow). Lassen Peak looks quite different from this eastern aspect, rocky and rugged and craggy. I followed the gully all they way to the cirque at the top of the drainage, with the snow barely continuous the whole way. It looked like it might be challenging to exit the cirque via the steep semi-permanent snowfield at its head, but luckily there was a skin track already in place from someone who had skied in from the other side earlier in the day. This glacial cirque is unique on Lassen Peak, since the lava dome erupted only about 11000 years ago (after the Ice Age) it has no major cirques carved into it. This small cirque still has a pair of fresh-looking nested moraines, evidence that a small glacier may have occupied it as little as 200 years ago during the height of the Little Ice Age. I think it's a very interesting spot, see this panoramic view of the cirque, with snowy Reading Peak in the distance. As I crested the top of the cirque at 8800 ft around 2 PM, clouds had been building for a couple of hours and the full force of the increasing wind suddenly hit me. I had hoped to skin back up to the summit crater and get a nice afternoon ski run down the West Gully beside the 1915 lava flow, but it was best to abandon that plan in the face of the worsening weather. So I traversed west to the summit trail and skied the steep face above the parking lot back to the car. Here are a couple of departing views: the South and SW Face of Lassen Peak above Lake Helen and the sad remnants of the nearly-demolished Lassen Chalet, razed in order to construct a new visitor center. View of the Northeast Face of Lassen Peak from Emigrant Pass. Click here for an enlarged version of this photo.